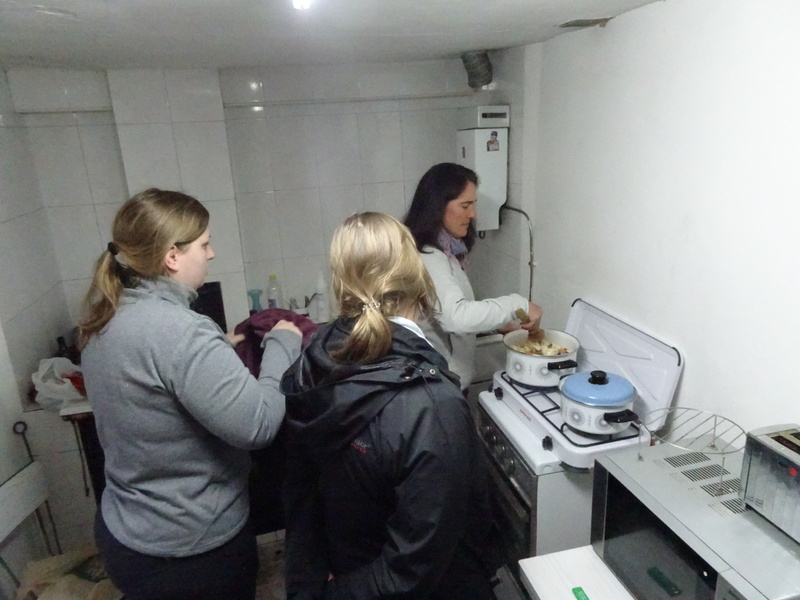 The tight kitchen has two burners connected to a gas tank, a microwave that may not work, a sink, a toaster and one table. We stack the toaster and microwave on the burners and pull the table out. We squeeze five chairs around it and juggle plates, dishes, forks, and knives until we are all wedged in together, knees knocking into thighs, elbows bumping arms, all circled around the food. Miss Janet took me aside once in her kitchen back in Erwin, Tennessee, a few hundred miles down the Appalachian Trail. She’d been helping hikers for years before I plopped down in her kitchen. She put people up, shuttled people around, cooked pancakes for breakfast and topped them with slices of ice cream. I was hiking fast, hadn’t taken a single day off, just kept walking every morning up and over those knobby southern mountains until I arrived at her place. She leaned in close and looked me in the eyes. She paused for a second, looking at me, making sure I was listening. The next day I took my first zero. I baked cookies in Miss Janet’s kitchen. I crashed a Chinese buffet and ate myself to death. I stayed up late talking life with Dragon Slayer. I never burned out. Never, not after Katahdin, not after Manning, not after Waterton, not at Key West or the Angle. Not in the fiercest storms or the cold of winter. Not under the desert sun or amid ocean waves. Never. I look around the tiny kitchen at my friends, at the half empty wine bottle and the full one waiting to replace it, at the homemade food on our plates, at our smiles, our laughter. Miss Janet would love this kitchen. “Her advice saved my hike,” I say, finishing the story, thinking of Miss Janet’s warm smile, of that kitchen long ago. I grin at my friends, at all of us wedged tightly together in the kitchen. It’s March 7th, the anniversary of my first steps on the Appalachian Trail. Glasses rise to clink together. Laughter and joy fills the air. Posted in Europe North to SouthTagged Camino de Santiago, ENS, Europe North to South, featured, SpainBookmark the permalink. To you, Miss Janet, all your new friends and those yet to come! We’re all in this together! Great way to start the day! Thanks! I remember your writing about Miss Janet long ago. It is sweet that you are able to give tribute to her again. Great memories! So glad you have them. So interesting to hear about those memerable touch points on your past journeys that were stepping stones to where you are at this very moment. I’d never heard of Mt. Katahdin, ME until today. Safe travels. Namaste.